Thinking about making some changes this year? Finding the right allies can help ensure your success, whether you’re changing the world or your career. 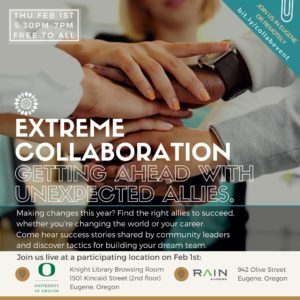 Come participate in the discussion as local community leaders share their stories of extreme collaboration gone phenomenally right, ask questions and gain insights on how this can apply in your life. Learn how to form a dream team to help you accomplish your goals, whether they are personal, professional, or societal in nature. Each workshop location will be setup to collaborate remotely and participants will be able to engage on their own. Bring a smartphone, tablet, or small laptop if you have one. 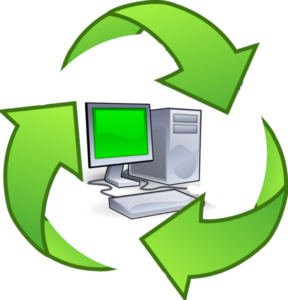 Remote participants are also welcome, though the program will appear slightly delayed compared with realtime participation. Follow this event for access to the stream on the day of the event. This event is made possible through the Mozilla Gigabit Community Fund, Redefining Women in Tech, EugeneTech, the City of Eugene, and Uphill Media. Previous PostBOARD MEETINGNext PostWHAT IS UNIVERSE?